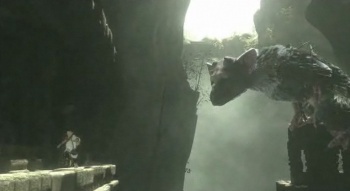 Sony president insists someone is still working on The Last Guardian. The Last Guardian, one of the gaming industry's longest running mystery projects, is still alive and kicking, according to Sony Worldwide Studios president Shuhei Yoshida. Speaking with Games Industry International, Yoshida confirmed once again that, despite a long media blackout, The Last Guardian is still in production. "So, we're waiting for the right time to re-introduce The Last Guardian in an appropriate way," said Yoshida. "I can't... Well, the game is in development, and it's well staffed, and Ueda-san is here, working - even though he's not a Sony employee, he's dedicated to the product. But we're not ready to update yet." "Hiatus, I never... It was Jack Tretton! He used that term, and I said no, hiatus is misleading. It was a hiatus in terms of releasing new information. The game has never stopped - the team has always been here. They're going through the re-engineering of the game, so the team size is smaller, because it's more engineering focused right now." Does that mean The Last Guardian is going to come out on PS4? Yoshida's not telling. For now, Yoshida's repeated insistence that the game will be more than vaporware will have to be enough for fans to hold on to.